This engaging ethnography examines the gendered nature of today's large corporate law firms. Although increasing numbers of women have become lawyers in the past decade, Jennifer Pierce discovers that the double standards and sexist attitudes of legal bureaucracies are a continuing problem for women lawyers and paralegals. Working as a paralegal, Pierce did ethnographic research in two law offices, and her depiction of the legal world is quite unlike the glamorized version seen on television. Pierce tellingly portrays the dilemma that female attorneys face: a woman using tough, aggressive tactics—the ideal combative litigator—is often regarded as brash or even obnoxious by her male colleagues. Yet any lack of toughness would mark her as ineffective. Women paralegals also face a double bind in corporate law firms. While lawyers depend on paralegals for important work, they also expect these women—for most paralegals are women—to nurture them and affirm their superior status in the office hierarchy. Paralegals who mother their bosses experience increasing personal exploitation, while those who do not face criticism and professional sanction. 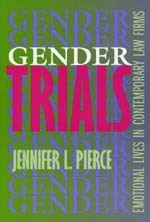 Male paralegals, Pierce finds, do not encounter the same difficulties that female paralegals do. Pierce argues that this gendered division of labor benefits men politically, economically, and personally. However, she finds that women lawyers and paralegals develop creative strategies for resisting and disrupting the male-dominated status quo. Her lively narrative and well-argued analysis will be welcomed by anyone interested in today's gender politics and business culture. Jennifer L. Pierce is Assistant Professor of Sociology at the University of Minnesota.